Customers reported quality issues in this eBook. This eBook has: Typos, Broken Navigation, Poor Formatting. Primal Endurance shakes up the status quo and challenges the overly stressful, ineffective conventional approach to endurance training. While marathons and triathlons are wildly popular and bring much gratification and camaraderie to the participants, the majority of athletes are too slow, continually tired, and carry too much body fat respective to the time they devote to training. The prevailing “chronic cardio” approach promotes carbohydrate dependency, overly stressful lifestyle patterns, and ultimately burnout. 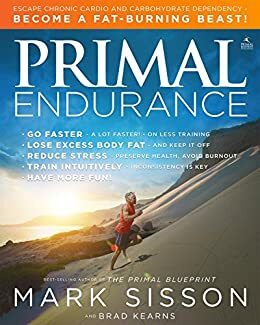 Mark Sisson, author of the 2009 bestseller, The Primal Blueprint, and de-facto leader of the primal/paleo lifestyle movement, expertly applies primal lifestyle principles to the unique challenge of endurance training and racing. Unlike the many instant and self-anointed experts who have descended upon the endurance scene in recent years, Sisson and his co-author/business partner Brad Kearns boast a rich history in endurance sports. Sisson has a 2:18 marathon and 4th place Hawaii Ironman finish to his credit, has spearheaded triathlon’s global anti-doping program for the International Triathlon Union, and has coached/advised leading professional athletes, including Olympic triathlon gold and silver medalist Simon Whitfield and Tour de France cyclist Dave Zabriskie. Under Sisson’s guidance, Kearns won multiple national championships in duathlon and triathlon, and rose to a #3 world triathlon ranking in 1991. Primal Endurance is about slowing down, balancing out, chilling out, and having more fun with your endurance pursuits. It’s about building your health through sensible training patterns, instead of destroying your health through chronic training patterns. While it might be hard to believe at first glance, you can actually get faster by backing off from the overly aggressive and overly regimented “Type-A” training approach that prevails in today’s endurance community. Primal Endurance will show you how, every step of the way. The New Primal Blueprint : Reprogram Your Genes for Effortless Weight Loss, Vibrant Health and Boundless Energy: The Definitive Guide to Living an Awesome Modern Life! Besides The Primal Blueprint, Mark has authored The Primal Blueprint 21-day Total Body Transformation, The Primal Connection (which won the Eric Hoffer Award in 2013 for best self-published book, and the Ben Franklin Award silver medal in the mind/body/spirit category); and numerous other books on cooking, athletic training, and health. Mark became a New York Times bestselling author with his 2017 title, The Keto Reset Diet, which also held the #1 overall bestselling book on amazon.com for a few days upon release. Brad Kearns is the New York Times bestselling co-author of The Keto Reset Diet, host of the highly acclaimed (at least by him, friends and family) Get Over Yourself podcast, world record holding Speedgolfer, and former US national champion and #3 world-ranked professional triathlete. As host of the Keto Reset online multimedia video course (ketoreset.com) and the Primal Blueprint keto podcast, Brad talks about keto all the time, which makes automatically makes him an expert. Brad likes to occasionally depart from keto guidelines with evening popcorn binges and excess dark chocolate consumption. Easy read, well structured and explained. I'm putting it to use through applying the principles for the coming marathon kayak season. 5.0 out of 5 starsthis book is a game changer for all types of runners! I love running! It is a passion for me and I was good at it for a time and then my health started to change. I was diagnosed with MS but that didn't stop me. Then bradycardia and a pacemaker. But that didn't stop me from running hard because i thought that is what you are supposed to do. Then low blood pressure and now trigeminal neuralgia. I kept running hard but getting sicker and it took my physical therapists to slow me down and read this book I started running aerobically after reading why I needed to do this and how it worked. I can't believe how it has changed me. I am stronger and have more endurance and know I am healthier. I love the humor in the book written by athlete's who understand the "brain" of an athlete and how crazy we can be.The book is also backed up by plenty of literature and facts that support running aerobically. I wish more cardiologists understood this and talked to their patients about this type of running while incorporating strength training and the keto food plan. I am a believer in the keto diet. I am a keto distance runner. It has helped me in general health, better performance, and quicker recovery. The writers are both great resources in this field. Unfortunately the book is way longer than it needs to be and contains a lot of repetition of the same few statements over and over again. You may enjoy it but I got bored and quit. Nothing new here. This is a great book for summarizing ideas that already have been on there for a long time, Phil Maffetone, Tim Noakes, and Matt Fitzgerald have been pushing these concepts of HR training and slow running for years. Sisson does a good job of summarizing them. And I can attest that these ideas, when applied correctly, do work. The book has some good info. Mark lead the pack with this nutrition info, some of the stuff catching on today (2019) I know he was pushing a decade ago. The book is a little obnoxious and reads more like a trend pushing magazine. Lots of photos of old dudes with their shirts off! I learned some good info but the book didn't quite live up to expectations. Mark's blog is more scholarly/academic sounding and less energetic. Its also not very concise and repeats itself often. 5.0 out of 5 starsDouble the calories of fat you burn at rest and with exercise in 4 weeks. I know because I tested. I must admit that I knew I would like this book before reading it, because I’m a huge fan of Mark and Brad, but now that I got it, I couldn’t put it down until I finished reading it cover to cover. I love that the title, primal ENDURANCE, speaks to all athletes, because endurance is a good thing no matter your sport. Your amazing human machinery is designed to outlast the energizer bunny -- as long as we are powered by the right fuel. Far and away, the most important concept and one that the book keeps returning to is the metabolic state of burning fat is essential to normal health. And contrary to what many athletes assume, its not just exercise that promotes fat burn, it’s also diet. So that no matter how much you exercise, if your diet does not contain the right nutrients, you will not burn fat optimally. I run a weight loss clinic and don’t always have time to go over a full exercise program with my patients so I have been waiting eagerly for a book that I can recommend it to my weight loss patients as well as the athletes I work with. This book is exactly what the doctor ordered. An engaging and easy to read book no matter how you slice it Primal Endurance offers much needed information that brings the best nutrition advise from the medical world into the world of fitness, while providing a balanced approach to exercise. As far as results you can expect in terms of improving your fat burn, I would expect that you could double your fat-burning capacity in 4 weeks, and go even further into fat burning beat territory the longer you follow this program. I use a similar dietary approach and test people’s fat burn before and after dietary intervention, and this is what I've found so far. For example, if someone starts the program burning 2 calories of fat per minute at rest and a maximum of 3 with exercise, they'll get to 4 and 6 respectively in a month easily. And that's without adding any exercise!